Bianca O’Donoghue is from South Africa and Hazim Mohamed is Sudanese with Egyptian roots, before meeting in Dubai, neither could imagine falling in love so quickly and having the wedding of their dreams in the heart of Europe. Bianca had always dreamt of Italy as the most beautiful destination to wed the man of her dreams. Lake Como, the place for the rich and famous, was her first option. 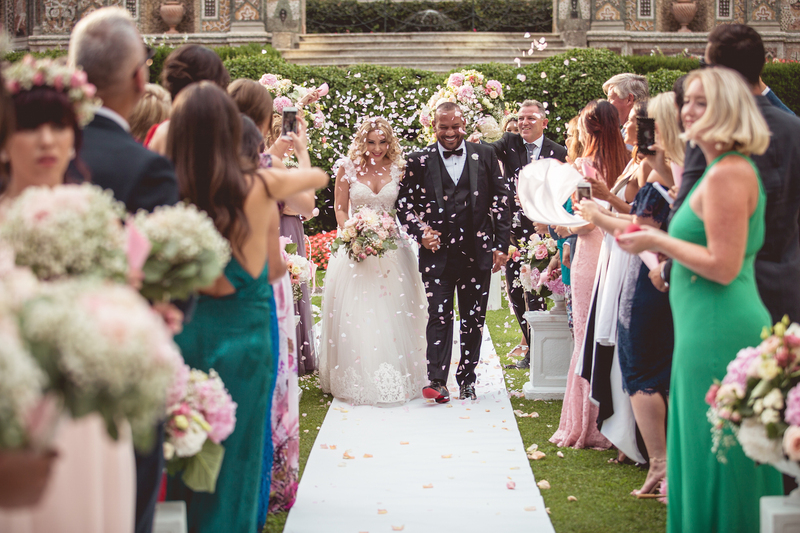 With guests coming from all over the world to celebrate their union on 20 August 2018, Bianca and Hazim chose Villa D’Este as their ideal location. This dreamy venue with a gorgeous 10-hectare park, centennial trees, statues and colorful flowers was a natural choice for a fairy-tale themed wedding. The venue was once upon a time a residence for aristocracy for centuries and then it turned in 1873 into a luxurious 5-star hotel. Just Amore Weddings by Anna K. , a destination wedding planners in Dubai, did not let the couple daydream for too long and started planning their destination wedding at Lake Como, with a smooth sailing just 5 months before the wedding. Bianca had a very precise vision of her wedding, she wanted a fairy-tale and absolutely romantic event with a white horse-drawn carriage, a pink-themed flower decoration, a refined 5- course meal, a sumptuous wedding cake adorned with fresh flowers and royal fireworks. Pink has always been Bianca’s favorite color and she has constantly incorporated a dash of pink in every special moment of her life. She had all her bridesmaids’ wear the same attire, true to her favorite pink color palette. Little pink umbrellas and pink fans were ordered to be placed on the chairs of the guests for the ceremony. The gardens of Villa D’Este, having such bright and powerful colors, needed no further enhancement. So, a combination of shades of dusky pink with white and ivory was chosen to soften the vibrant colors of the gardens of this destination venue. Anna and her team from Just Amore organized a very romantic ceremony in the stunning mosaic garden. Bianca made her grandiose entrance with her white carriage at the sound of violins. Her dress was simply stunning with a 6-meter veil, made to measure by a famous Italian atelier, Tosetti Sposa. After the bride and groom exchanged their vows amidst tears of emotions, guests were then entertained to a lavish cocktail reception on a terrace overlooking Lake Como, followed by the five-course dinner they have selected served in the magnificent Imperial Ballroom. The cake cutting ceremony took place on the adjacent terrace and was accompanied by a majestic firework show displayed in the middle of Lake Como. Of course, the party that took place in the hotel's nightclub was a perfect ending to this royal wedding. One of the greatest singers in the Italian region, who frequently performs at VIP and private dinners entertained the guests till dusk and a surprise belly dancing show was arranged as a special request from the bride to honor the Egyptian roots of her husband.